Alabama is a state in the southeastern United States. The state's nickname, "The Heart of Dixie" reflects its heritage as a key southern state. Although northern parts of the state are mountainous, most of the state is gentle plain with a gradual decline towards the Mississippi River and the Gulf of Mexico. Historically, Alabama's economy was based on large cotton plantations in the state's central Black Belt region. However, modern Alabama has a more diverse economy and produces both agricultural and industrial goods, as well as containing the important sea port of Mobile. 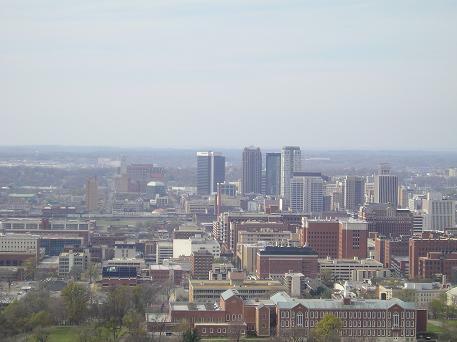 Although perhaps best known as an agricultural state, there are urban areas in Alabama, and these include the capital, Montgomery, as well as the Birmingham-area. Ave Maria Grotto in Cullman: Also known as "Jerusalem in Miniature", and constructed by Brother Joseph Zoetti, a Benedictine monk, the Ave Maria Grotto is a 4 acre park containing 125 miniature reproductions of famous shrines and historical buildings from around the world. Battleship Memorial Park in Mobile: Home to the battleship USS Alabama, the submarine USS Drum, as well as many tanks and aircraft. Bellingrath Gardens and Home 20 miles (32 kilometers) Southwest of Mobile: A beautiful 65-acre garden estate that offers walking tours, cruises on the Fowl river, and is home to an award-winning rose garden. Birmingham Museum of Art in North Birmingham: Contains an outstanding collection of over 21,000 works of art. DeSoto Caverns Park 36 miles (58 kilometers) Southeast of Birmingham: Offers guided tours through the state's biggest cave which is 12 stories high and larger than a football field. There are also a variety of family attractions in the park outside the caverns. Early Works Museum Complex in Huntsville: An impressive complex of three history museums including a hands-on history museum for children and a railroad museum. International Motorsports Hall of Fame Museum in Talladega: This museum, next door to the Talladega Superspeedway records and celebrates the history of motorsports. Exhibits include the Budweiser rocket car which was the first car to break the speed of sound. Noccalula Falls Park in Gadsden: A 250-acre public park containing a legendary waterwall, as well as caves, Indian and civil war carvings, a pioneer homesteed, a mini-golf course, a petting zoo, and more. Robert Trent Jones Golf Trail throughout the state: A must-see for golf-lovers. The Trail is a result of the largest golf course construction project ever attempted. and contains over 400 holes spread across multiple sites around the state. U.S. Space & Rocket Center in Huntsville: contains the United States' largest collection space memorabilia and rockets including the Pathfinder shuttle simulator and a Saturn V moon rocket. Important education institutions in Alabama include Tuskegee University (in Tuskegee) and the University of Alabama (in Tuscaloosa). Sports teams in Alabama include the Birmingham Barons (Southern League baseball) in Hoover, the Huntsville Stars (Southern League baseball) in Huntsville, the Mobile BayBears (Southern League baseball) in Mobile, and the Montgomery Biscuits (Southern League baseball) in Montgomery. The principal airport serving Alabama is Birmingham International Airport which is in Birmingham. Places to visit in Alabama. Books containing travel information for Alabama. Information and books about the history of Alabama. Information about skiing for Alabama. Towns and cities in Alabama.